​Bishop, once cherished by his guardian, is homeless, scared and alone on the hard streets of New York City. 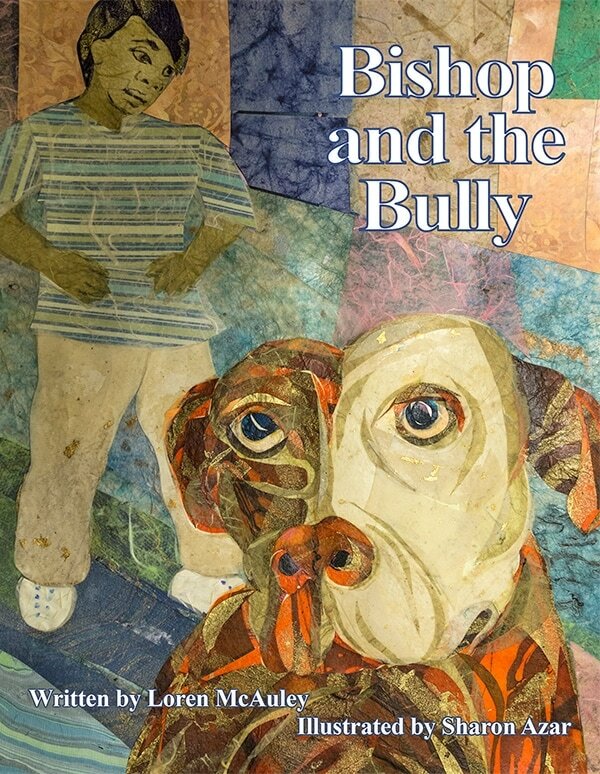 Though a big dog, Bishop fears the sights and sounds of the city, the awnings, the men in hoods, the car honks, but most of all, he fears the sound of basketballs ... that is how he encounters a group of young boys bullying a smaller boy on a court. When he meets their leader, a boy he calls "Alpha Boy", he feels a deep connection. Bishop knows there is more to him than just being a "bully". Boy and dog come to help each other, to save each other, in ways that change both their lives ..
Loren McAuley, Co-Founder of Rebound Hounds. Her short fiction has appeared in New Millennium, New York Press, New Rivers Press, among others and has been anthologized in American Fiction Volume 11. Sharon Azar, artist, studied under Otto Franz Krone and Sarah Reader. Her style of "paper mosaic" is a unique collage process using different layers of paper over the images.